Katelyn Bennett was born in 2012 with Spina Bifida, a birth defect where the spinal cord fails to develop properly, leading to health complications. When Katelyn turned six months old, her mother Heather discovered the concept of adapted toys for children who had conditions such as Spina Bifida. However, the toys were limited in availability and were very expensive to purchase. "Children learn through play. They learn physical, cognitive, and social skills which are all very important to their childhood development. A child with a disability is no different. They have the desire and need to learn cause and effect, develop fine motor skills, develop social skills, gain self-esteem, and learn how to interact with their world," said Bennett. "Most toys are designed for the typically abled child. A special needs child may not have the physical or cognitive ability to operate many toys that are readily available." Bennett went on to create Katelyn's Kloset, a non-profit organization intended to help children with special needs and their families gain access to adapted toys. At around the same time Katelyn's Kloset was kicking off, a similar goal was being explored at Ohio State through the Toy Adaptation Program, which is co-run by Assistant Professor of Engineering Education Rachel Kajfez and Program Manager and Advisor for the Green Engineering Scholars Program Elizabeth Riter. 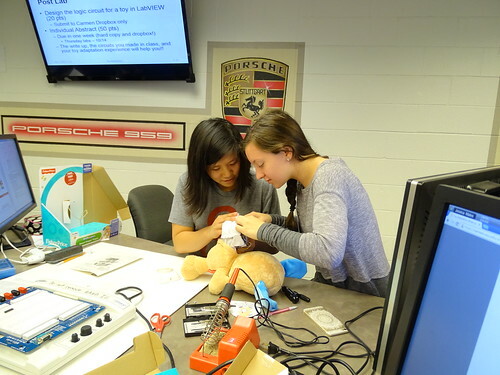 The goal of the Toy Adaptation Program is to allow engineering students at Ohio State to serve their community through supplying electronic toys they modify to suit the needs of children with different abilities. Meg West, a Toy Adaptation Program intern and undergraduate student at Ohio State, spoke more about how the program benefits the families they target. "The families benefiting from TAP would otherwise not be able to access toys that their children can use due to either monetary or geographical limitations," she said. "Participating in the toy adaptation process teaches students and community members about the positive impact they can have on someone's life." In terms of future goals, the program would like to start up workshops where family members can be taught ways in which they can modify toys themselves, said West. The toys that are currently being modified are donated to several toy libraries, with one of them being Katelyn's Kloset. Bennett talked about how beneficial this reciprocal partnership has been to both organizations. 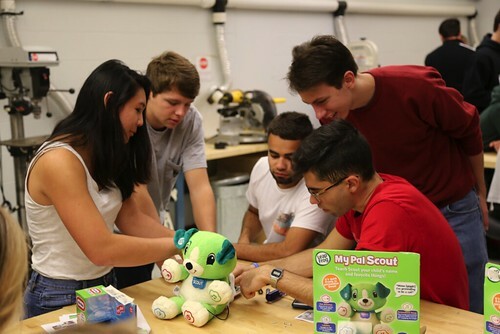 "I first learned how to adapt a toy at an OSU workshop. Three months after that workshop, Katelyn's Kloset officially opened with an inventory of over 200 adapted toys that were all created by local high school and college students. The partnership has been extremely effective in growing the two programs. We have learned from and been able to support each other along the way." While being the co-founder of the organization, she is first and foremost the mother to Katelyn, and has been able to experience firsthand how it has benefitted her daughter. "Katelyn has been able to use many different types of toys and switches as a result which has allowed her to make huge strides in the area of fine motor skill development. This gave us a front line perspective of how beneficial adapted toys are." West had similar sentiments at seeing just how beneficial these special toys are for children and their development. She recounted one of her favorite moments where she got to deliver a specialized toy to a little girl at Nationwide Children's Hospital. "As we presented toys to the little girl her face lit up with excitement, she knew those toys were just for her. It's not easy being a child that is always going to doctor's appointments and visiting the hospital on a regular basis. Knowing that we have helped give a small reprieve from the challenges she faces every day makes all the work we do worthwhile." The current efforts are made possible by two grants (Impact Grant from the Office of University Outreach and Engagement; and Battelle Engineering, Technology and Human Affairs (BETHA) Endowment Grant from the Office of Research). If you would like to contribute to this program to support future efforts, donations can be made at go.osu.edu/osutap.